TLDR -- check photos and scroll to bottom for summary! This is what it looks like right after I got the box opened. I didn't smell any product yet, just the usual paper/box. I love how she uses the golden tissue paper, you know something good is behind it and its a really neat way to unveil it with a single colored paper which doesn't appear to be special on its own. Its kind of like entering the gates of Disneyworld. You know what lies ahead, but you can't see it just yet! When I removed the golden paper, this is the next thing that I saw. Fun Mardi gras ephemera, even a necklace! Lots of colorful tissue papers and shredded paper grass for extra padding. 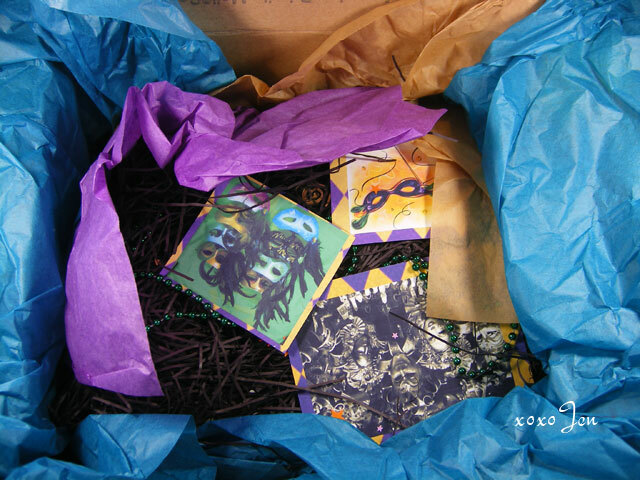 The Mardi gras prints smelled soft and clean, yep I sniffed them! This part of the package opening is like the walk through the tunnel at Disney where you see the "movie posters", advertising what you're about to see. So now you've got confirmation that its gonna be awesome and fun! After I lifted the shredded paper and mardi gras prints, I found the precious! 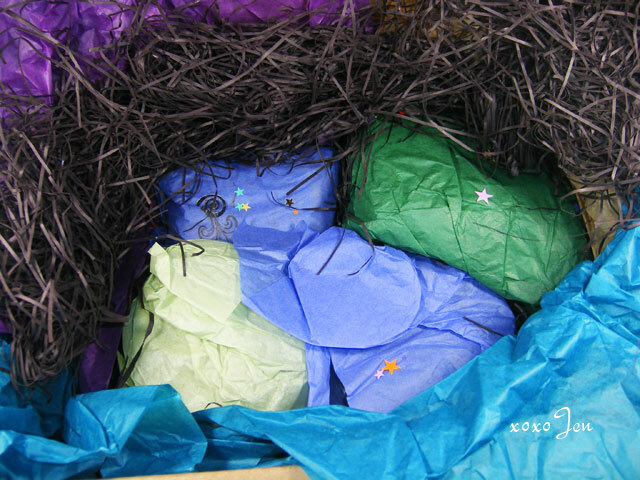 All wrapped up in colorful tissue papers with shiny confetti all around! 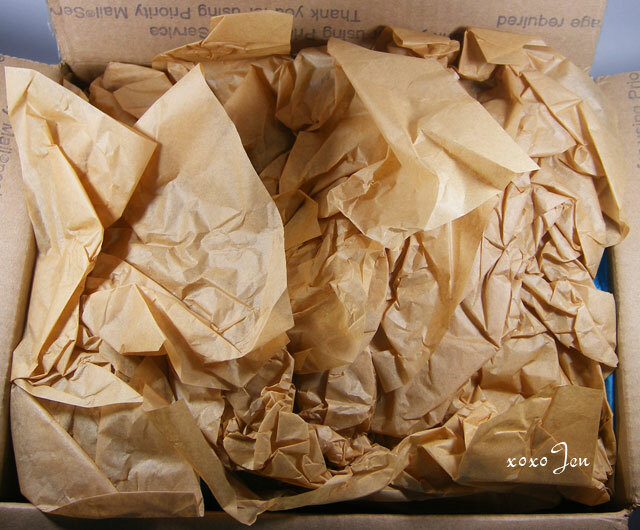 As I unwrapped each item, I noticed the tissue paper had been stamped with a golden Fluer de Lis, X marks the spot! After unwrapping, each item was also enclosed in a heat sealed plastic bag. This is comparable to the walk down main street at Disney - looking in shop windows, hearing the music and realizing you're really there! Every once in a while you get a whiff of the waffle cone and taffy coming from the ice cream shop! And now that we've walked through the tunnel and down main street, we can see the Disney Castle! Hooray!! xD It was kind of bold of me to compare this to Disney, but Moona really is an experience from start to finish and I believe that the unveiling of Moo is very similar to how Disney does it. Lemon Tart and Coconut Curd pie slice soap - definitely like crack, I want lemon meringue pie now. stat! Banana Tarte Tatin Parfait Scrub - smells caramelly on top, can't wait to see how all the layers smell! Cafe Du Monde Parfait scrub - oh this one smells soooo yummy! Like coffee and chocolate, can't wait to sniff the layers of this too! Tea Reader perfume (it has the cutest little roller ball top!) Smells beautiful! Just like fresh, sweet tea, with a teeny floral note. Very unique! Samples in Witches Tea Pot Lot (new formula) - This is a sandalwood vanilla scent, so I'm not crazy about it. I've already offered to swap this away to someone on another forum. I posted a message to Moona at FB and kind of a summary of what I've already told you guys, so if you want the short of it, here ya go!